Bollywood’s glamorous and beautiful actress Mallika Sherawat recently met US President Donald Trump’s first wife, Ivana Trump. That’s the glamorous and beautiful actress of Bollywood who described herself and Ivana Trump’s meeting as a very nice and lovely experience. He said that it was very nice to meet Ivana Trump. It was a good experience. Actually tell you. Information about this meeting has been tweeted by Bollywood actress Mallika Sherawat herself with her official Twitter account. Bollywood glamorous and beautiful actress Mallika Sherawat on Tuesday from her Twitter account. It happened with your Ivana Trump. The photos of the meeting were tweeted. 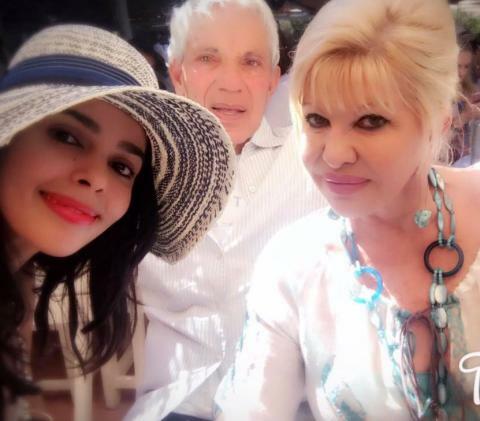 That same twitter tweet through Sharing photos with you and Ivana Trump meeting Bollywood actress Mallika Sherawat wrote in the caption, “Nice to talk with Ivana Trump, she is a great person.” She is a great personality. ” Meeting with them was a good experience. Indeed, America’s President Donald Trump’s first wife, Ivana, is a Czech American woman businessman and former fashion model. Ivana and Donald Trump had married in 1977. But in 1992 both of them got divorced. And began to separate from each other. Talk about Bollywood’s glamorous and beautiful actress Mallika Sherawat’s film career. So Mallika Sherawat’s last Bollywood movie “Dirty Politics” came in 2015. In this picture, along with Mallika Sherawat, actors like Nasruddin Shah, Jackie Shroff, Anupam Kher and Om Puri had also acted in this film. But Mallika Sherawat has been in the same year since 2015. No film has come in Bollywood yet. This glamorous and beautiful actress of Bollywood Mallika Sherawat appeared in Chinese film “Time Riders” in 2016. Since then, it has not been seen in any film. Bollywood actress Mallika Sherawat has disappeared from Bollywood’s Limelight for the past two-three years. Neither do they have any news to go to the award function. Neither do the news of the release of a picture.